Fragrant white blossoms with soft pink and chartreuse markings on strong stems are a welcoming sight. Ht: 48". 6-8" flowers. Welcome visitors to the property by adding Bonbini to the landscape. This Oriental Lily variety is the ideal choice for decorative planters, container gardens and borders along sidewalks or entryways. The fragrant blooms are large and outward facing with a coloration that blends white, pink and chartreuse hues for a softly elegant look. Magnificent when grouped in threes, fives or more. 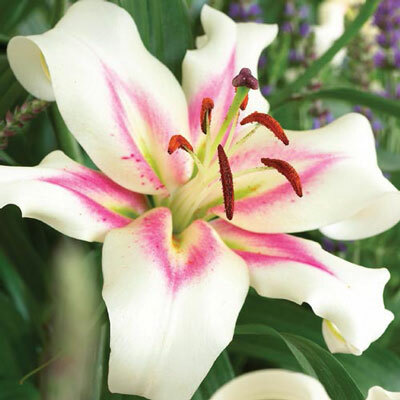 In recent years, the interest in Oriental Lilies has grown dramatically. The flowers are very popular in bouquets and arrangements, making Bonbini a great cutting garden addition. 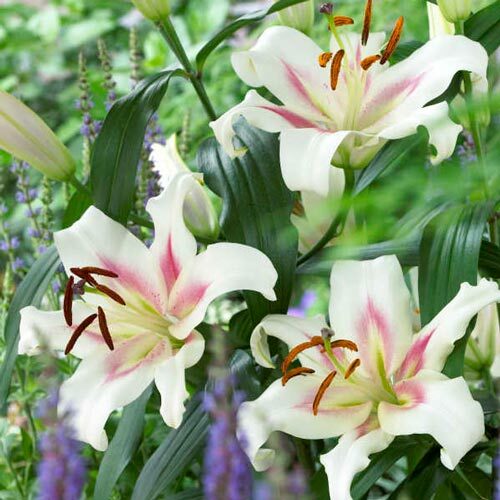 Oriental Lilies are easy to grow and attract beneficial pollinators such as butterflies to garden sites. Mulch lightly for winter protection. Linear, glossy green leaves arranged in whorls or spirals up erect stems. Prefers well drained soil, but will tolerate heavier soils. Don't remove leaves until they have died down in fall. They help provide nourishment to the bulb for next season's blooms. Provide a layer of mulch for winter protection. Remove in early spring. Average water needs. Water regularly, do not overwater.